Alex “Petra” Venz puts the NZXT DOKO through its paces to see if it’s worth your hard earned… bananas? It’s new, it’s fancy, it’s… a $99 box? Yes, the new NZXT DOKO is a box but it’s a box that’s meant to give you the experience of having your PC in your living room. The DOKO plugs into your TV via HDMI (cable not included) and works in conjunction with a bit of software installed on the host computer to mirror the output of said computer to the DOKO over hardwire ethernet. DOKO is equipped with four front-facing USB ports that make use of USB over IP technology, allowing any connected input devices to behave as though they are connected directly to the host computer. DOKO’s USB ports don’t currently support webcams or headsets, but most other USB peripherals should function without issue. Essentially, anything that your computer can do, DOKO can do—at least, that’s the idea. Full disclosure: NZXT provided two DOKO review samples to The Mod Zoo while at CES. While the concept behind DOKO is exciting and full of possibilities, the reality of living with the device in its present state is less than spectacular. This was first made clear to me when my TV (a Panasonic TC-P50GT30) refused to detect the DOKO when directly connected via HDMI. To NZXT’s credit, the issue was solved after the second firmware patch they pushed out during the time I was testing. However, the DOKO still refuses to play nice with either of my Denon AVRs (an older AVR-891 and an E400), requiring me to change inputs every time the DOKO is restarted in order for the device to be detected. See that metal plate? That’s why the DOKO weighs so much. While it may seem silly, the added weight does a reasonable job of preventing the DOKO from moving around when stiff cables are attached. Full resolution version available here. …but how does it perform? Keeping in mind that the DOKO is limited to 1080p at 30Hz and that it requires a 1080p source resolution to function optimally, its performance leaves much to be desired. From a video streaming standpoint, compression artifacting is noticeable and video playback simply isn’t smooth regardless of whether it’s a file local to the source PC or if you’re streaming something like Netflix. In addition to the lack of playback smoothness, I encountered occasional hiccups that resulted in all playback stopping for a fraction of a second. Serious gamers: beware, this is not the device for you—the delay is murder. All of my testing was done alternating between a Win 7/i7 2600K/GTX 580 box and a Win 7/X6 1090T-BE/HD 6870 box as the source PC—neither of which represent the latest and greatest in hardware, but both are still very capable machines. Some have reported that DOKO performs best under Windows 8/8.1, but all I had available at the time was Windows 7. Considering that only 30% of The Mod Zoo’s audience visits the site using Windows 8/8.1, I think it’s safe to say that my experience under Windows 7 will prove valuable to our readers. The DOKO was connected to a Denon AVR-891 which, in turn, was connected to my TV’s primary HDMI input. For the sake of variety, I tested with Team Fortress 2, StarCraft 2: Heart of the Swarm, and Diablo 3: Reaper of Souls. Team Fortress 2: Put simply, don’t bother playing TF2 through the DOKO. The experience was so disorienting and mouselook so disconnected that it just about made me sick when I played with the Frame Sync option enabled. There was so much delay between my mouse inputs and the results displayed on the screen that a quick left-right motion of the mouse would have the mouse moving in the opposite direction of the on-screen POV. Disabling Frame Sync improved the experience somewhat, but the mouselook still felt disconnected. Despite the 30fps limitation of the DOKO, the in-game framerate didn’t seem to be significantly lacking. The fundamental problem was just that the game would react to my inputs noticeably after I made them. StarCraft 2: SC2 was very frustrating to try playing at anything higher than about a 30APM pace because the delay and, more importantly, fluctuations in the delay made it nearly impossible to have any sort of precision when it came to grabbing units. Additionally, the screen jumped around a fair bit when panning across the map, and I experienced lots of issues with mouse overshoot. There was also the occasional missed keypress or missed click, as though the DOKO simply didn’t relay the input to the source PC. Playing with the Frame Sync option in the DOKO control panel didn’t make much difference in playability in this case; however, disabling in-game v-sync on the source PC was essential. Diablo 3: D3 fared better than the other two games I experimented with, as it was mostly playable. Mouse overshoot, lag spikes, and screen stutters still occurred, but were less of an obstacle due to the nature of the game. The variability of the delay in all cases made it pretty much impossible to adapt to, and the more stuff was happening on screen (i.e. the more that needed refreshing), the more delay I’d experience. With this information in hand, I decided to run some simple tests to gain insight into how much delay was being introduced at each hardware step in the DOKO user experience. The 1/8000 sec. exposure time is quick enough to catch the plasma display’s pulsing sub-field drive in action. I employed the old reference display/target display photographed timer approach to obtain input lag data for the TV’s primary HDMI input, secondary input (not displayed), the connected AVR-891, and the DOKO itself in several configurations. Keep in mind that all of the latency information in the table below is relative to the Dell U2312HM that was used as a reference monitor. Each average value represents the mean of 30 data points, with the maximum and minimum observed values in the set shown only for the DOKO tests since there wasn’t meaningful variation in the non-DOKO tests. The base input lag of the TV’s primary HDMI port was approximately 18ms relative to the reference display, with the secondary HDMI input (not shown or used for further testing) clocking in at about 50ms. The Denon AVR-891 introduced an additional 15ms delay. The DOKO tests are broken into two test sets: one where the timer was the only changing object on screen and frame sync was toggled on/off and another where a full screen video of slow product pans from CES was played behind the timer (like with the first set, this was also done with frame sync on and off). The latency introduced by the DOKO when nothing much is going on averaged a relatively inoffensive 63-68ms. As on-screen activity increased, in this case a video of slow product pans, the average latency climbed to around 102-104ms and while that doesn’t sound all bad by itself, the wide fluctuations in latency (68ms at the minimum and 151ms at the maximum), and the fact that the delay is introduced into the typically tight coupling between the human input and the video explain a lot about the gaming experience I had during testing. That said, the timer method that I used for latency testing does not quite represent load experienced during gaming, nor does it take into account the latency introduced on the input device end due to USB over IP, making these numbers fairly conservative. Once you start stacking the delay, especially if you’re using a TV that exhibits significant input lag, you can see how the usefulness of the DOKO from a gaming perspective quickly begins to fade. In the case of the example above, the average total delay would come to around 135ms, which basically means that what I was reacting to on screen was at least four frames (at 30fps) behind actual game time. I understand that NZXT is trying to broaden their customer base and brand visibility with the introduction of a device as ambitious as the DOKO. 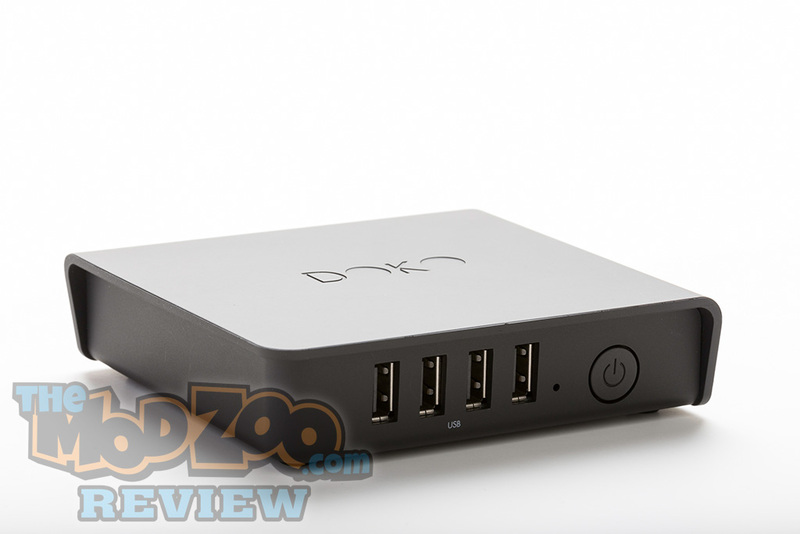 My concern lies in that DOKO doesn’t really seem to meet the needs of many of the core enthusiasts who are already familiar enough with NZXT’s brand to give the device a shot. The concept behind DOKO is certainly a worthwhile one to pursue, the $99 price point is fantastic, and I can foresee DOKO maturing significantly with future software/firmware updates. At present, though, the realm of the DOKO is best left to business presentations, checking e-mail, web surfing, casual gaming, and maybe Hearthstone.